This was a really challenging trek. 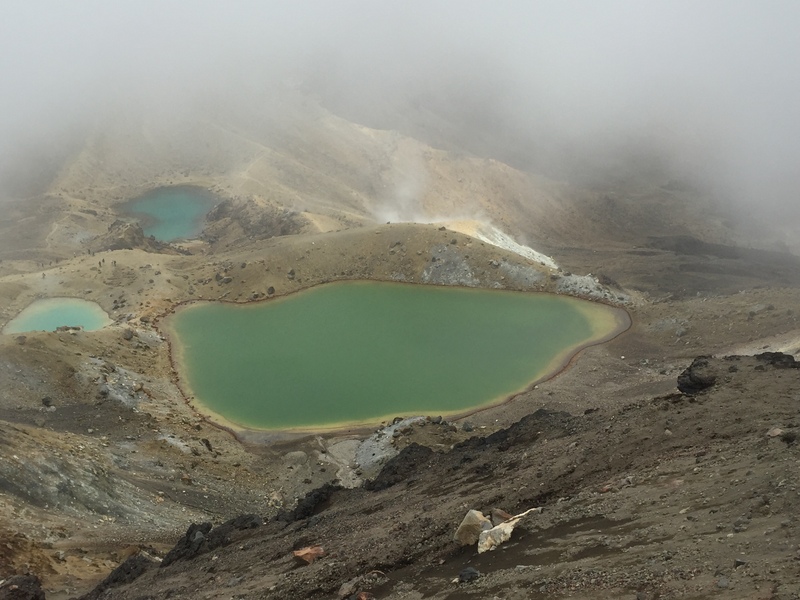 The Tongariro Northern Circuit is a 43k (26+ mile) loop through an alpine forest, up and over volcanic craters and back through barren valleys. It’s meant to be completed in three to four days, so of course Allen and I thought we could do it in two. We stopped at the visitors’ center at the trail head. The Department of Conservation (DOC) representative there warned us that it was windy, up to 60km/hr which can knock you off your feet. 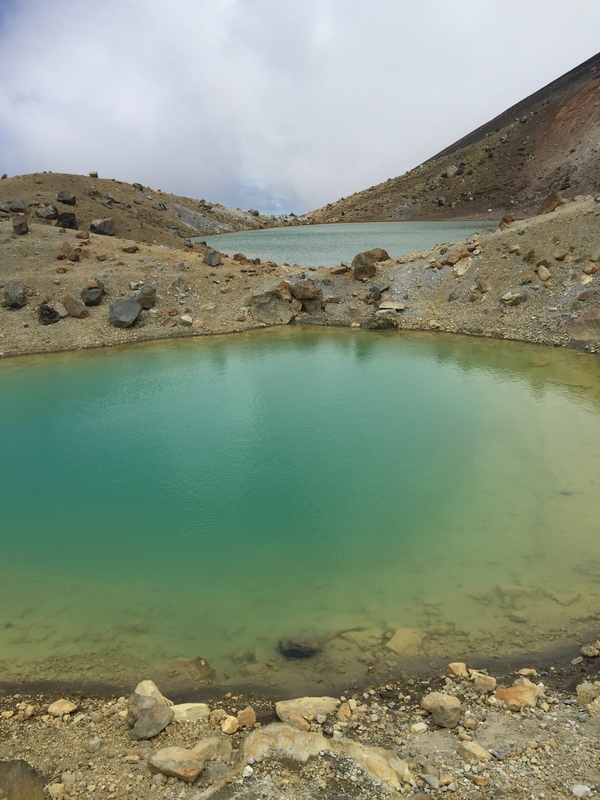 Her concern for us was clear and we almost called it a day and headed home, but we decided to attempt “the crossing.” The section over the mountains is known as the Tongariro Alpine Crossing. I had knots in my stomach from nervousness and fear. We stopped for lunch and I could only eat half my sandwich. About six hours into the hike we climbed to over 1800m, the highest point on the circuit. At first the path on the ridge was wide so we were comfortable even with the steady wind. There was one section that was narrow and particularly dicey. We had to stay low and did not stick around to take in the views. At a spot a bit later we took shelter behind a rock to take a picture of Red Crater, which was mostly hidden by clouds and mist. The descent was steep and soft, like walking downhill in snow drifts. Two hours later we were at Oturere hut, our accommodation for the night. Sunday morning we started the second half of the loop at 6am. By 9 it was raining steadily. By 10 I’d had enough. If there was an easier way to get off the trail I would have taken it, but I was already on the fastest route – three to four more hours of wet, cold walking, with a limp, because by this point my right knee was killing me. 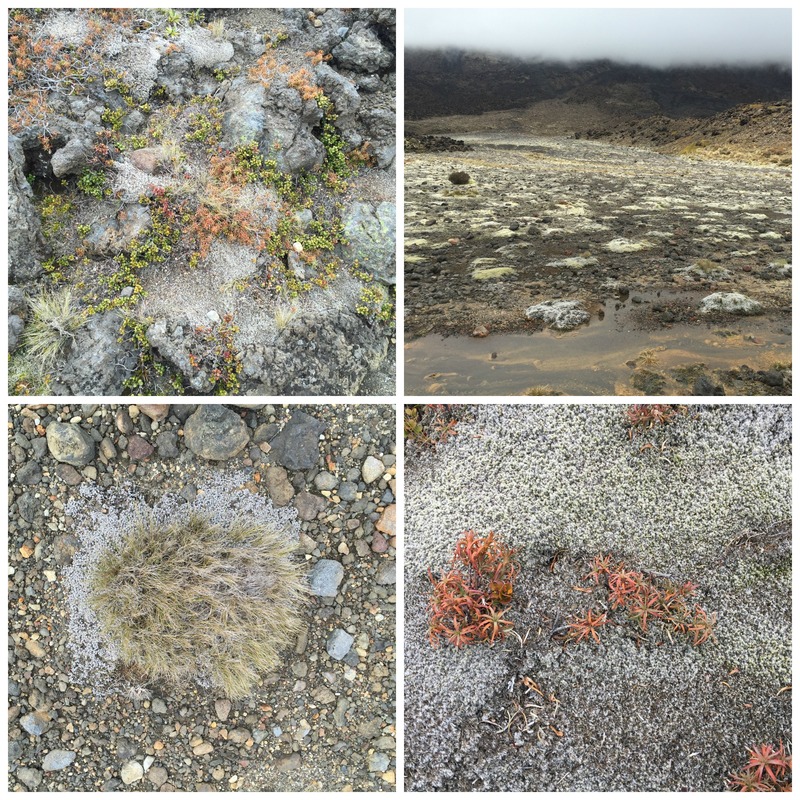 Of the 7 hours we hiked on Sunday, 6 were fully exposed to the wind and rain – not a tree in sight. The final hour was miserable. Even my well-worn hiking boots became uncomfortable. So, we made it. It was hard to muster enthusiasm for the finish, but looking back I can appreciate the beauty of the lakes coming into view and the moon-like atmosphere, shrouded in mist and clouds just before we reached the summit. Weather: Saturday was windy, 55-60km/h winds with wind chill at 0 degrees Celsius; Sunday was less windy, but steady drizzle from 9am.